You’ve been thinking about it again, haven’t you? You can almost smell it now, that savory scent of smoked meats wafting through the air. You can almost taste the unparalleled flavor of smoked ribs, brisket, beef, chicken, and more. Just thinking about it all makes your mouth water. Finally, you settle on the matter. You have to upgrade your grill to something that delivers more flavor and versatility. You’ve decided you have to have a pellet grill. But before you rush online or over to your nearest retailer, there are plenty of important details to consider when searching for the right pellet grill. With this in mind, read on to learn what you should look for and why. Perhaps you haven’t quite reached the point outlined in the hypothetical scenario above. Maybe you’re considering a pellet grill for the first time, or maybe you’ve heard your friends or colleagues talking about them and you’ve decided to research the matter yourself. Great, that’s why we’re starting this article by answering this important question: why are pellet grills such a great choice for barbequing? Whether you know the answer already or not, this brief buyer’s guide will both create and reinforce a decision to invest in pellet grilling, and it will go over all the matters you need to consider when searching for the right pellet grill. For starters, pellet grills are fueled by burning small compressed pellets of real wood, and are perhaps the single best barbequing option for the backyard barbeque fan. It’s important that you choose pellets wisely to keep ash off the food and save money. Read more about premium pellets in our article “Taste the Premium Wood Pellet Difference”. Pellet grills are better than traditional grills for three distinct reasons, and those reasons are: flavor, ease-of-use, and versatility. Together these characteristics make a pellet grill an exceptional investment in your barbequing future. There’s no replacement for or equal to the flavor of smoked meats, and this is something easily accommodated with a pellet grill. If you think the only way to produce quality, smoked meats is by using a large and elaborate stick (log) burning grill like the pros use, think again. A pellet grill produces the same, great, smoked flavor as the large, aforementioned alternative, and it does so with far less hassle, which brings us to the next selling point: ease-of-use. You see, if you’re going to smoke meats with a large and expensive stick burner, then you better be well versed in what you’re doing, and you better be ready to devote a lot of time to monitoring your cooking. 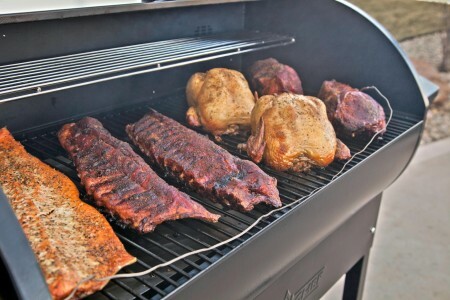 With traditional smokers and stick burners, you have to truly monitor the entire process in order ensure that your smoker remains within the proper temperature range. What’s more, you have to know how to change the temperature when it begins to fluctuate, when to add another log, adjust air flow, etc. Learning this art takes a lot of time, and perfecting it takes even longer. With a pellet grill, however, you can forget about having to deal with any of that. 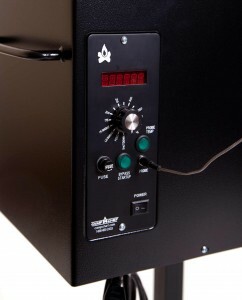 Pellet grills work with the push of a button and the dial of a knob. And that’s no exaggeration. Push-button ignition lights the flame that’ll keep your pellets burning, and arrows or knobs are used to adjust the temperature setting. The right kind of pellet grill is extremely accurate with its temperatures too. Variances in your set temperature are likely to be as little as 10 degrees, give or take. In addition to being easier to use than a stick burner, pellet grills are also much easier to manage than your common charcoal grill. Make no mistake, your average stick burner or charcoal grill does offer great, smoky flavor to whatever your smoking/grilling, but it all comes at the cost of long hours monitoring and tweaking the flame and temperature, not to mention it makes for a considerable amount of cleanup too. Imagine all the flavor of traditional smoking or charcoal grilling without the hassle associated with either, and you’ve just imagined what a pellet grill offers. It’s the cheat mode of grilling. 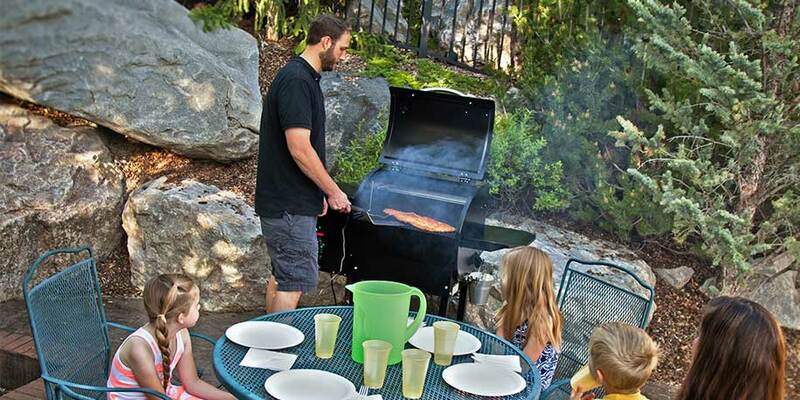 Pellet grills come with all the convenience of gas grilling, without the need to store or refill on propane, and all the flavor of traditional smokers. 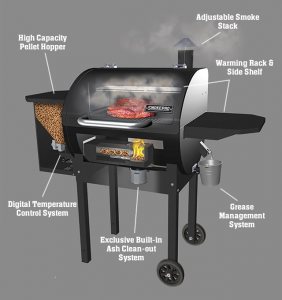 Subsequently, they also offer far more versatility than traditional smokers, charcoal, or gas grills. Gas grills, for example, are fine for cooking hot dogs, burgers, and steaks (albeit they still lack the flavor of real wood barbeques) but if you’ve ever wanted to cook something bigger, like a whole chicken, your gas grill isn’t going to cut it. This is often the same case with charcoal grills, except that they add great flavor. Conversely, a stick burning smoker isn’t something you’d ever use for cooking a few burgers or chicken thighs. Pellet grills, on the other hand, can handle both smoking and grilling jobs. Whether you want to slow cook/smoke your meats, or you want to quickly grill up some patties or chicken drums, a pellet grill is a convenient answer. Whichever option you go with, you get savory, real-wood flavor. With all the different pellet options available, you can cook with convenience and variety, from hickory to Applewood, pecan, classic alder, and more. Now that it’s apparent why pellet grills are so great to use in your barbequing, it’s equally important to know what to look for in a pellet grill. Consideration of the subject begs to question: are all pellet grills created equal? The answer: no, they aren’t. As is the case with just about everything, there are varying levels of quality and features from one pellet grill to the next, and it’s important to know why quality is a must and what features are necessary for a grill to be a great pellet grill. Speaking on the subject of quality, it’s worth mentioning that quality is always important. Some grills may look real pretty on the outside, but on the inside, they lack the same attention to detail. Sometimes, a grill will be constructed of high grade stainless steel externally while its guts are made of lower-grade metals. This is problematic not for aesthetic reason, but for functionality and longevity. In other words, if the heart and soul of your grill isn’t made well, you’ll burn through it over time, literally. As far as functionality is concerned, you want a unit that is well built, with efficiency in mind. There’s a fine balance to strike between encasing a grill (particularly the burn pot) in a sufficient wall of steel verses a grill that’s made bomb proof. If the grill casing is too thin, then it won’t retain heat as well, and as a result, you’ll burn through more pellets, especially in colder temperatures. On the other hand, you can overdo it. A super thick-walled grill (a.k.a. bomb proof) will be too heavy to move around because of the shear weight. If you look at a traditional, industrial-grade smoker, you’ll find that the walls are rather thick, and that’s a necessary thing, in order to regulate temperature. However, since a pellet grill has an internal computer regulating temperature, additional thickness isn’t needed. If you want to take efficiency to an even higher level you can wrap your grill friend in a blanket that will keep her warm year round. That can reduce pellet consumption by up to 50% during the winter months, and save you money year round. Don’t worry, the blanket is built to handle the heat. Speaking of temperature-regulating computers, we come to our next point; and that’s temperature control…precise temperature control to be specific. When shopping for a pellet grill, temperature control is a necessity; else you lose the convenience that comes with using a pellet grill. There’s more than one way to approach temperature control, but the commonality among high quality grills is the use of computer-regulated temperature control. Not all manufacturers have durable control units so check out the reviews before buying! Whether it’s PID (proportional, integral, derivative) temperature control or some other equivalent, the name of the game is precision. Fluctuations should be within 10°F, give or take. This mean you want to steer away from grills that boast of heat zones. Heat zones are nothing to boast about. It simply means that the grill is incapable of maintaining a fairly narrow temperature range and instead can only maintain temperature within a broad “zone.” You’ll also want to avoid pellet grills that use baffles or any other manual form of air flow for temperature regulating purposes. For a pellet grill, your fuel is pellets, which is great for all the reasons mentioned in the beginning of this article. Being that your fuel is pellets, you’ll want to make sure the pellet grill of your choice has a containment unit (known as a hopper) that is large enough to hold the amount of pellets you’ll need. 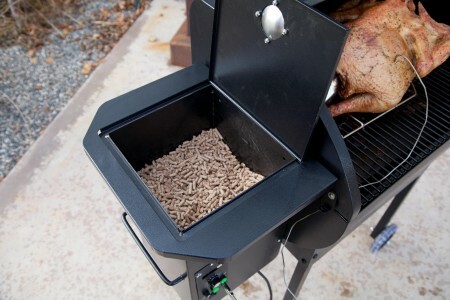 A good size hopper, somewhat of the standard among good pellet grills, is 18 lbs. With an 18 pound hopper, you can cook for a long time, enough for the long slow-cook times associated with smoking your meats. But if you have a hopper much smaller than this, you’ll have to refill with pellets more often. Another important quality to any grill is the cooking surface. First off, you want a cooking surface that is made of high-quality metal, as already mentioned. But you also want a cooking surface that is sufficiently large for the amount of cooking you’re going to want to do. Camp Chef pellet grills come in a range of sizes, from 429 sq. inches to 875 sq. inches. So whether you’re going to do small amounts or large amounts of smoking and grilling, we have an option for you. Another important thing to consider is looking for a pellet grill with convection style circulation. All Camp Chef Smokepro pellet grills come standard with a continuous convection fan that significantly reduces natural hot spots typical of grills in the marketplace. Think of it as cheat mode. You don’t have to figure out where to place your meat since the temperature is very close no matter where you place it on the grill grates. Another very nice feature of pellet grills is their extreme burn efficiency. This is due to the nature of the fuel used to produce the burn. Pellets actually burn far more efficiently than charcoal, and even more efficiently than logs. This means they produce a lot less waste. If you’ve ever used a charcoal grill, then you know that they’re a mess to clean up. The ash box fills quickly and often, requiring frequently cleaning. Real wood burning leaves a lot of char too, and if you’re using a log burner, then you’ll have substantial amounts of clean up to do. Here’s the beauty of burning pellets though. Because the pellets are compressed wood, they’re quite a bit denser than real wood. Because they’re denser, they burn through easier and produce a lot less ash. Camp Chef pellet grills are by far the cleanest burning, real-wood grills available. So you’ll be cleaning out your ash box a whole lot less. As mentioned earlier, it may be only once a year. Whatever the frequency is, you’ll want to get a grill that accommodates very easy cleanup. For example, Camp Chef pellet grills come with a patented Ash Can Cleanout System that is so simple and easy to clean that it becomes a matter of simply detaching a can and dumping it in the garbage. It’s a big ash deal. 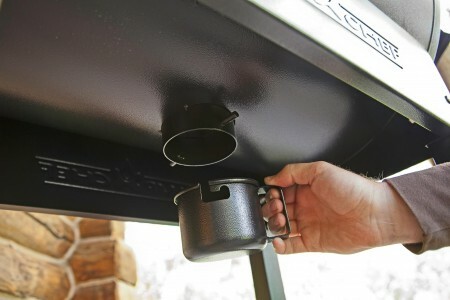 What’s more, Camp Chef pellet grills have the added feature of a hopper cleanout and purge system too. After everything we’ve mentioned here, you can see that there is a lot to consider when shopping for a pellet grill. We hope you feel a bit like an expert in pellet grills after reading through this, but for the sake of a brief recap let’s visit the qualifiers of a good pellet grill one more time, in a quick list. Remember, the advantages of a pellet grill are: • Flavor Delivery – nothing can replace that savory smoke flavor. • Ease of Use – getting that smoky flavor the traditional way is difficult and messy, but with a pellet grill, it’s never been easier or cleaner. • Versatility – Charcoal grills are messy, and stick burners are only for really big jobs. The pellet grill, however, can cook your small quantities and large smoke jobs, from burgers and dogs to whole turkeys. Remember, when buying a pellet grill, you’re looking for: • High Quality Construction – you want something built to last, but you don’t want a pellet grill built like a stick burner. • Functionality and Efficiency – you want a grill that isn’t going to go through pellets like there’s no tomorrow. • Precise Temperature Control – temperature control is so important; you want to set and forget. Set the temperature and walk way without babysitting, that’s how easy it should be. 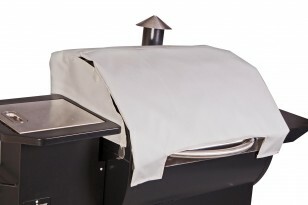 • Fuel Containment and Cooking Surface – you need a hopper that’s big enough (around 18 lbs.) and a cooking surface that can handle your plans. • Easy Cleanup – you don’t want a grill that’s high maintenance and takes a lot of work to clean. Now that you know what to look for in a pellet grill take a moment to consider the quality pellet grills we produce here at Camp Chef. We know you’ll love what you find. 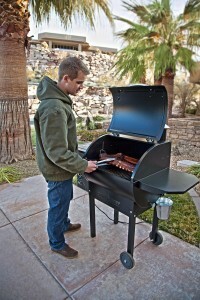 Every camp chef pellet grill and smoker is designed with the home griller in mind. Made of high-quality materials, our pellet grills deliver functional efficiency time and time again. 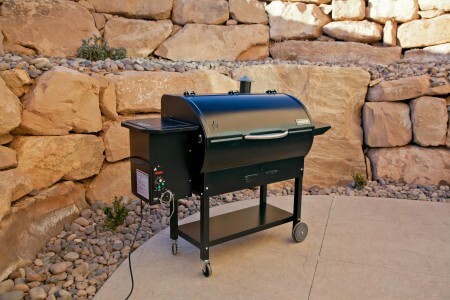 Our built-in features simplify the process of smoking and grilling, making the experience enjoyable and hassle free. Camp Chef’s automatic auger dispenses pellets as needed for improved smoking efficiency, and the hopper purge and patented Ash Can Cleanout System makes clean up the easiest out there. Digital temperature readouts take the guesswork out of the cooking process, and an advanced digital temperature chip provides the steady and consistent temperatures needed for smoking. By eliminating large temperature swings, you can confidently set the temperature and walk away. Additionally, the stainless steel temperature probe enables you to monitor the internal temperature of your meats, ensuring that they’re cooked to perfection. With our range of SmokePro Pellet Grills, you can choose the grill that’s right for your needs. And with an 18 pound hopper, you can keep on smoking and grilling for hour after hour without needing a refill.